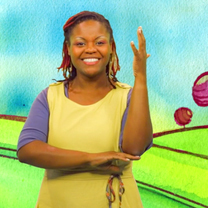 Teaching the link between Sign Language and English: Lesson Plans available! So excited to share these brand new lesson plans that I helped create with the folk over at the Visual Language Learning Centre in Washington DC. Children can watch the eBook story in American Sign Language, then do several activities. They can work on their sign language through role-shifting activities. They can learn about the link between English sentences and sign language. Let me give this example. The lesson plans ask the children to think about the action verb EAT, and how they can sign eating fast, slow, loud in sign language. Then English words like munch, chomp, scarf and nibble are explored. I can imagine a lesson becoming fun very quickly with examples of rapid hoovering and slurping in sign language and having the children find some equivalents in the English language. The bilingual lesson plans are for all primary classroom teachers and sign language teachers. While the lesson plans focus on ASL, they can easily be adapted to BSL or any other sign language if you can find a good storybook and use the lesson plans as a guide. See my post here on the different types of eBooks available.